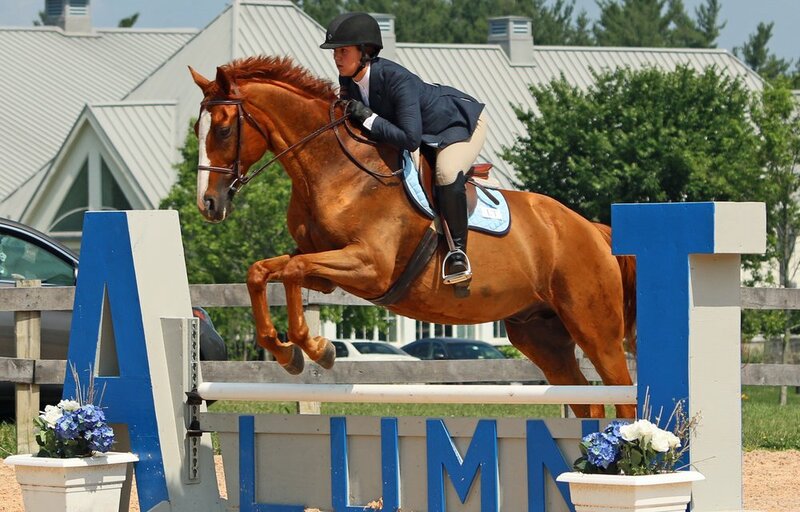 We give IHSA alumni the ability to continue to compete after college in a finals-like atmosphere to reconnect with old friends, make new ones, and stay connected to collegiate riding. The Alumni Tournament of Champions is a unique event in the riding world. We began this annual event in the summer of 2012 and invite anyone who has ever participated in collegiate riding to relive those memories. Our horse show invites riders from across the United States to compete in one day of competition for 14 championship titles in IHSA style Alumni competition. We offer both English and Western riding disciplines for collegiate alumni and graduating seniors. As this is IHSA style riding, horses are provided for riders at the show. This allows riders from far away to travel to compete more affordably. This generates a strong pull of riders from all across the country. We have 14 championship titles we award annually. Included in those are our cup classes. There are two phases of competition for each of four our cup classes and the combined scores plus additional testing crowns our champions. We pride ourselves in our rich show prizes. Ribbon winners go home with long beautiful ribbons and the best in sponsored prizes as well as champions are awarded with perpetual trophies for the year and silver to keep! In true IHSA style all horses are provided for riders. IHSA alumni that are not currently showing as part of the IHSA are invited to compete in our reunion classes. We offer a reunion flat and 2'6 fences class. Reunion riders may also choose to participate in the 2'3 fences class. Two phases of competition, either flat and fences or horsemanship and reining. Champagne is always presented to the champion! We offer two horsemanship classes for IHSA alumni. You do not need to be currently showing in the IHSA to compete in these classes. Riders will work on the rail and compete in a pattern chosen by the judge. We also offer two reining classes for IHSA alumni. You do not need to be currently showing in the IHSA to compete in these classes. Riders will complete one of the IHSA approved reining patterns. Our team challenge encourages riders to form teams of 3 riders so that everyone riding whether they came alone or with friends has at least 2 other competitors cheering for them. Our high score award recognizes the efforts of active alumni competition throughout the year. Points from riders top 7 shows are combined and awards are provided to the top 6 alumni entered at ATOC. Our annual horse show occurs each June. The prizelist is generally published in February and entries open March 1st and close in Mid May. If you have questions about any of our programs, please contact us. The night before ATOC is always a party! Please join us for complimentary food, beverages and awards. High Score awards are presented at the exhibitor party. Thank you to the IHSAA for sponsoring! We are always looking for help in planning the show or the day of! If you would like to be involved to help gather sponsors, develop social media or pitch in an extra hand for set up or awards, let us know! We are incredibly honored to have the sponsors and incredible prizes for our riders that we do. If you're interested in donating prizes or sponsoring a class or amenity, we would be extremely grateful.